** Of all the musical styles of the 20th century, the classic ballroom crooning of the inter-war period is perhaps the most forgotten and the least likely to be revived. As a style, it is perhaps too mannered, too much of its time and, to be blunt, too strange and campy for modern ears. 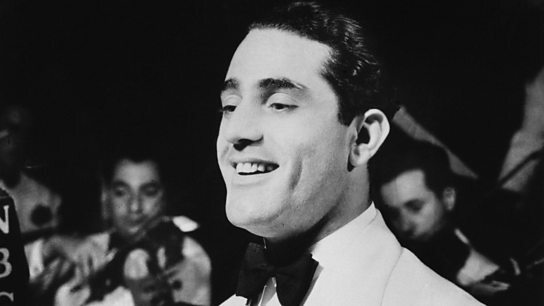 However, one crooner from the '20s and '30s who deserves to be remembered (but is now largely forgotten) is the great, the tragic Al Bowlly. I personally love his music, perhaps for its other-worldly sweetness, innocence and sincerity. These are not qualities you associate with most contemporary music. Bowlly not only crooned the lightly jazz-inflected, romantic songs that your grandparents loved and danced to, he also wrote some of the most memorable tunes of the 20th Century. He had a brief yet blazing career at the top. And then was killed at the height of the London Blitz. So I thought I would share his story and celebrate his genius in a small way. As another performer and songwriter, Richard Thompson, sings, Al Bowlly's In Heaven. ***When Stanley Kubrick went in search of music for the chilling ballroom scene in The Shining - where frustrated writer and Dad Of The Year candidate Jack Torrence enjoys a bourbon-on-the-rocks surrounded by spectral ballroom dancers, he went to his '20s musical adviser John Wadley. What Wadley brought him was a 1934 recording of "Moonlight, The Stars And You", featuring the voice of a long forgotten crooner called Al Bowlly backed by The Ray Noble Orchestra. Kubrick brilliantly used the sweet and innocent sentiments of this syrupy ballroom song as a contrast to the increasing psychosis of Jack Torrence. It is, of course, a very chilling, unsettling scene. And it is Al Bowlly's voice we hear as the tuxedoed barman tells Jack; "Your money is no good here....orders from the house". Even by the time the recording was made in 1934, Bowlly's style of singing was beginning to go out of fashion. The brassier, hipper, more high-octane sound of American big band Swing era, led by the likes of Glen Miller, Count Basie and Benny Goodman, was about to sweep the old crooners away. As a young man in South Africa, he worked odd-jobs as a barber and a jockey before taking off on an eccentric trek around South Asia, singing in ballrooms, working on tramp steamers and even busking in restaurants and bars to keep body and soul together. He was the resident crooner in the ballroom of the Raffles hotel in Singapore, delivering the "Moon & June" melodies of the era as up-country planters and their wives fox-trotted between the potted palms in the tropical night. When he eventually washed up in London (he almost didn't make it after gambling away the fare that had been lent to him by a band-leader) Bowlly, with his syrupy voice, dark good looks and dapper style, became a hit, one of the biggest stars of the dance-band era. He had success in the UK, America and on the continent, selling huge amounts of sheet-music (the singles of the day) and popularising many 20th Century classics. Billed as "Al Bowlly - The Ambassador of Song", his concerts from venues such as the Monseigneur Restaurant in London were broadcast live to millions of enchanted radio listeners, his slightly other-worldly, echo-heavy voice pouring out of illuminated-dial valve-radios in homes across Britain. Bowlly also tasted success in the US, and for a very brief time, was one of the highest paid vocalists in the business, a serious rival to Bing Crosby. He recorded between 500 and 1,000 songs (some are lost) and either co-wrote or popularised such classics as "Blue Moon", "Easy To Love", "I've Got You Under My Skin", "The Very Thought Of You" and "My Melancholy Baby". Such was his success, Bowlly was given his own radio show on NBC and went to Hollywood to co-star with Bing Crosby in The Big Broadcast". However, Bowlly's unwillingness to stay in one place or with one band, together with problems with his vocal chords, led him to return first to London, then South Africa, hoping that the change in climate would do him well. He lost his voice for long periods, fritted away his money and had to borrow cash to pay for a voice-saving operation in New York in 1938. My favourite Bowlly song is the one written by his regular band leader Ray Nobel in 1932 and made popular by the man himself, the sublime "Love Is The Sweetest Thing". Bowlly's first marriage, in 1931, ended on his wedding night, when he found his new bride in bed with another man. He married again just before the Second World War, when his career was seriously on the slide and he was playing regional ballrooms and restaurants in England, in a bid to pay the bills. On April 17th, 1941, Bowlly had just given a performance at the Rex Cinema in Oxford Street, High Wycombe, when he decided to turn down the chance to stay locally and get a late train back to his flat on Duke Street, St James, London. The decision proved fatal. Bowlly's apartment was destroyed by a Luftwaffe parachute mine that detonated on the street outside during a raid in the early hours of the morning. The bomb blew the door of his bedroom off its hinges and the impact of the door on his head killed him instantly. There was not much notice of his death, not at a time when hundreds of people were being killed every night by the Luftwaffe. Bowlly was quickly buried, along with other Blitz victims, in a mass grave at Hanwell Cemetery. By the time he had died, the era of the big band crooners had already come to an end. The sweet, sentimental dance music may not have been in step with the furious energy and tension of the war-time years. In the post war years and on into today, you rarely hear his name or his voice. But Al has left a rich legacy of song and his voice echoes occasionally in popular culture. He was a more natural performer than most of the crooners, with an easy style and a laidback phrasing that foreshadowed the later style of singing embodied by Sinatra. One of my favourite mentions of Al in recent years came in a very overlooked British Movie, I Really Hate My Job, with the great actor Danny Houston delivering a cameo as a ghostly crooner. Houston's performance is sweet, slightly strange and other-worldly. Just like the voice of the great Al Bowlly. Loved it. Thank you for writing this. Hi, this was an interesting read. Al Bowlly is a fascinating subject. I sort of remember hearing of him years ago, and lately, with the arrival of youtube, got to hear many of his recordings. I wrote a short story about him for a writing group competition just before Christmas. If you'd like to read it, maybe you could give me a critique of it - and point out any bits I got wrong!